1. Grease a 9×13 inch pan. 2. In a large saucepan, heat corn syrup and sugar over medium heat. Stir frequently until sugar dissolves and mixture comes to a boil. 3. Meanwhile, in a microwave-safe bowl, melt the chocolate and butterscotch chips. Start with a 45 second microwave session. Stir the chips. Continue microwaving at 30 second intervals and stirring until chips are melted and smooth. 4. 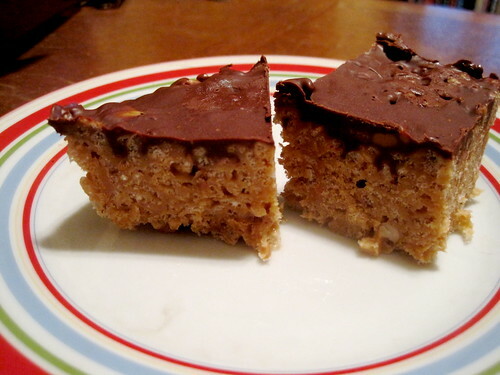 Mix the peanut butter and then the Rice Krispies into the sugar mixture. You want to entirely coat the cereal with gooey goodness. 5. Evenly spread the cereal mixture into the 9×13 inch pan and press it all down gently. Spread the chip mixture on top. Chill in the refrigerator until the chocolate has hardened. 1. Preheat oven to 200 degrees F. Line a baking sheet with a brown paper bag. 2. Cut the corn from the cobs into a large bowl, and scrape the stripped cobs with the back of the knife (or a spoon) to release the juices into the bowl. 3. Place 2 cups of the corn kernels into a food processor, and pulse several times, until the corn is slightly pureed but still chunky. Scrape into the bowl with the remaining corn kernels. 4. Add flour, cornmeal, onion, basil, baking powder, baking soda, salt and pepper to the corn. Stir to mix. 6. Place a large skillet over medium heat. Add just enough canola oil to barely cover the bottom, and heat until sizzling hot. 7. One heaping tablespoon at a time, scoop the batter into the skillet. Cooking in batches of 4 to 5 to avoid overcrowding, fry the cakes 1 to 2 minutes per side, until golden brown. 8. Drain on the lined baking sheet, and place in the oven to keep warm while cooking the remaining corn cakes. 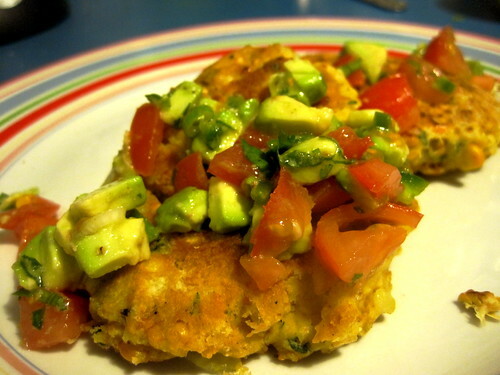 Serve warm topped with a heap of Chopped Tomato and Avocado Salsa. 1. Place all of the ingredients (except the avocado) in a bowl, and stir to mix. Refrigerate in an airtight container until ready to serve, for up to 2 days. 2. Just before serving, add the avocado, and mix gently.